The Cherenkov effect/Cherenkov radiation, sometimes also called Vavilov-Cherenkov radiation, is our topic here in this post. 1st. The polarization of luminiscence changes sharply when we apply a magnetic field. Cherenkov radiation luminescence is then causes by charged particles rather than by photons, the -ray quanta! Cherenkov’s experiment showed that these particles could be electrons produced by the interaction of -photons with the medium due to the photoelectric effect or the Compton effect itself. 2nd. The intensity of the Cherenkov’s radiation is independent of the charge Z of the medium. Therefore, it can not be of radiative origin. 3rd. The radiation is observed at certain angle (specifically forming a cone) to the direction of motion of charged particles. The Cherenkov radiation was explained in 1937 by Frank and Tamm based on the foundations of classical electrodynamics. For the discovery and explanation of Cherenkov effect, Cherenkov, Frank and Tamm were awarded the Nobel Prize in 1958. We will discuss the Frank-Tamm formula later, but let me first explain how the classical electrodynamics handle the Vavilov-Cherenkov radiation. This equation can not be satisfied for the vacuum but it MAY be valid for a medium with a refractive index gretear than one . We will simplify our discussion if we consider that the refractive index is constant (but similar conclusions would be obtained if the refractive index is some function of the frequency). In conclusion: the laws of conservation of energy and momentum prevent that a charged particle moving with a rectilinear and uniform motion in vacuum from giving away its energy and momentum in the form of electromagnetic radiation! The electromagnetic radiation can not accept the entire momentum given away by the charged particle. with respect to the observation direction of the particle motion. These arguments, based on the conservation laws of momenergy, do not provide any ide about the real mechanism of the energy and momentum which are lost during the Cherenkov radiation. However, this mechanism must be associated with processes happening in the medium since the losses can not occur ( apparently) in vacuum under normal circumstances ( we will also discuss later the vacuum Cherenkov effect, and what it means in terms of Physics and symmetry breaking). We have learned that Cherenkov radiation is of the same nature as certain other processes we do know and observer, for instance, in various media when bodies move in these media at a velocity exceeding that of the wave propagation. This is a remarkable result! Have you ever seen a V-shaped wave in the wake of a ship? Have you ever seen a conical wave caused by a supersonic boom of a plane or missile? In these examples, the wave field of the superfast object if found to be strongly perturbed in comparison with the field of a “slow” object ( in terms of the “velocity of sound” of the medium). It begins to decelerate the object! Question: What is then the mechanism behind the superfast motion of a charged particle in a medium wiht a refractive index producing the Cherenkov effect/radiation? Answer: The mechanism under the Cherenkov effect/radiation is the coherent emission by the dipoles formed due to the polarization of the medium atoms by the charged moving particle! The idea is as follows. Dipoles are formed under the action of the electric field of the particle, which displaces the electrons of the sorrounding atoms relative to their nuclei. The return of the dipoles to the normal state (after the particle has left the given region) is accompanied by the emission of an electromagnetic signal or beam. If a particle moves slowly, the resulting polarization will be distribute symmetrically with respect to the particle position, since the electric field of the particle manages to polarize all the atoms in the near neighbourhood, including those lying ahead in its path. In that case, the resultant field of all dipoles away from the particle are equal to zero and their radiations neutralize one to one. This is the result we anticipated before. Indeed, it is completely general and Quantum Mechanics instroudces only a light and subtle correction to this classical result. 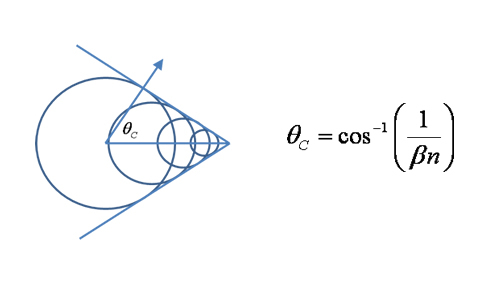 From this last equation, we observer that the Cherenkov radiation propagates along the generators of a cone whose axis coincides with the direction of motion of the particle an the cone angle is equal to . This radiation can be registered on a colour film place perpendicularly to the direction of motion of the particle. Radiation flowing from a radiator of this type leaves a blue ring on the photographic film. These blue rings are the archetypical fingerprints of Vavilov-Cherenkov radiation! 1st. The spectrum is identical for particles with , i.e., the spectrum is exactly the same, irespectively the nature of the particle. For instance, it could be produced both by protons, electrons, pions, muons or their antiparticles! 2nd. As Z increases, the number of emitted photons increases as . 4th. is approximately independent of . We observe that . And then, this feature explains the bluish-violet-like colour of the Cherenkov radiation! Indeed, this feature also indicates the necessity of choosing materials for practical applications that are “transparent” up to the highest frequencies ( even the ultraviolet region). 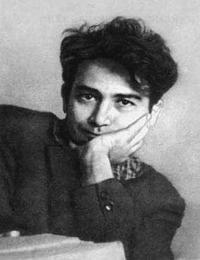 As a rule, it is known that in the X-ray region and hence the Cherenkov condition can not be satisfied! However, it was also shown by clever experimentalists that in some narrow regions of the X-ray spectrum the refractive index is ( the refractive index depends on the frequency in any reasonable materials. Practical Cherenkov materials are, thus, dispersive! ) and the Cherenkov radiation is effectively observed in apparently forbidden regions. The Cherenkov effect is currently widely used in diverse applications. For instance, it is useful to determine the velocity of fast charged particles ( e.g, neutrino detectors can not obviously detect neutrinos but they can detect muons and other secondaries particles produced in the interaction with some polarizable medium, even when they are produced by (electro)weak intereactions like those happening in the presence of chargeless neutrinos). The selection of the medium fo generating the Cherenkov radiation depends on the range of velocities over which measurements have to be produced with the aid of such a “Cherenkov counter”. Cherenkov detectors/counters are filled with liquids and gases and they are found, e.g., in Kamiokande, Superkamiokande and many other neutrino detectors and “telescopes”. It is worth mentioning that velocities of ultrarelativistic particles are measured with Cherenkov detectors whenever they are filled with some special gasesous medium with a refractive indes just slightly higher than the unity. This value of the refractive index can be changed by realating the gas pressure in the counter! So, Cherenkov detectors and counters are very flexible tools for particle physicists! Note that if the medium is non-dispersive, this formula simplifies to the well known formula . As it should be for vacuum. where is the critical Cherenkov angle seen before, is the central value of the small frequency range under consideration under the Cherenkov condition. This cone has an opening half-angle (please, compare with the previous convention with for consistency), and unless the medium is non-dispersive (i.e. , ), we get . Typical Cherenkov radiation imaging produces blue rings. where, like before, , n is the refraction index, is the De Broglie wavelength of the moving particle and is the wavelength of the emitted radiation. Cherenkov radiation is observed whenever (i.e. if ), and the limit of the emission is on the short wave bands (explaining the typical blue radiation of this effect). Moreover, corresponds to . where is the angular frequency of the radiation, with a maximum value of . Remember: is determined with the condition , where represents the dispersive effect of the material/medium through the refraction index. The refraction index is a function of photon energy , and it is also the sensitivity of the transducer used to detect the light with the Cherenkov effect! Therefore, for practical uses, the Frank-Tamm formula must be multiplied by the transducer response function and integrated over the region for which we have . 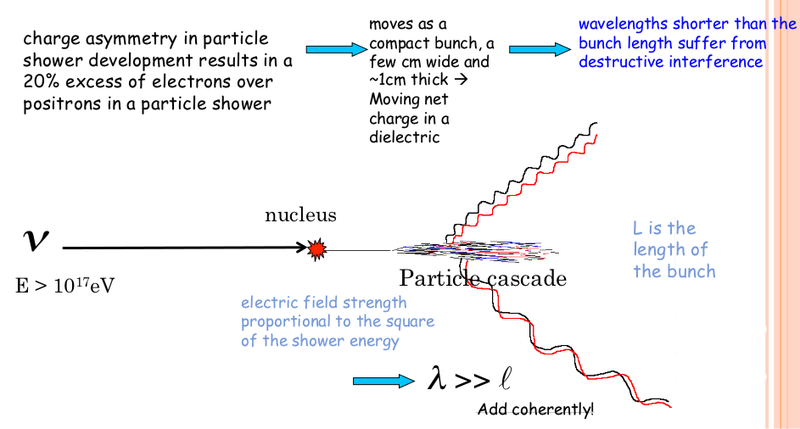 Remark: When two particles are close toghether ( to be close here means to be separated a distance wavelength), the electromagnetic fields form the particles may add coherently and affect the Cherenkov radiation. The Cherenkov radiation for a electron-positron pair at close separation is suppressed compared to two independent leptons! 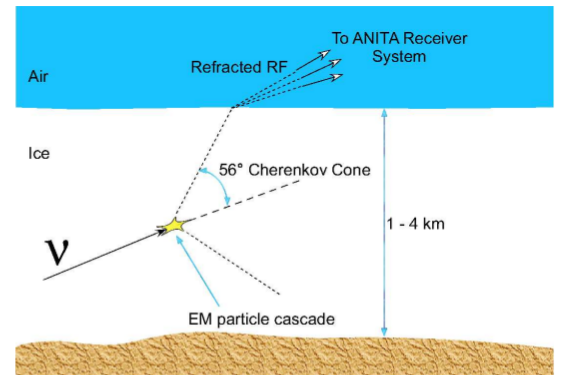 Remark (II): Coherent radio Cherenkov radiation from electromagnetic showers is significant and it has been applied to the study of cosmic ray air showers. In addition to this, it has been used to search for electron neutrinos induced showers by cosmic rays. The applications of Cherenkov detectors for particle identification (generally labelled as PID Cherenkov detectors) are well beyond the own range of high-energy Physics. Its uses includes: A) Fast particle counters. B) Hadronic particle indentifications. C) Tracking detectors performing complete event reconstruction. The PDG gives some examples of each category: a) Polarization detector of SLD, b) the hadronic PID detectors at B factories like BABAR or the aerogel threshold Cherenkov in Belle, c) large water Cherenkov counters liket those in Superkamiokande and other neutrino detector facilities. Cherenkov detectors contain two main elements: 1) A radiator/material through which the particle passes, and 2) a photodetector. As Cherenkov radiation is a weak source of photons, light collection and detection must be as efficient as possible. The presence of a refractive material specifically designed to detect some special particles is almost vindicated in general. Remark(II): Cherenkov detectors are classified into imaging or threshold types, depending on its ability to make use of Cherenkov angle information. Imaging counters may be used to track particles as well as identify particles. 1st. Detection of labeled biomolecules. Cherenkov radiation is widely used to facilitate the detection of small amounts and low concentrations of biomolecules. For instance, radioactive atoms such as phosphorus-32 are readily introduced into biomolecules by enzymatic and synthetic means and subsequently may be easily detected in small quantities for the purpose of elucidating biological pathways and in characterizing the interaction of biological molecules such as affinity constants and dissociation rates. 2nd. Nuclear reactors. Cherenkov radiation is used to detect high-energy charged particles. 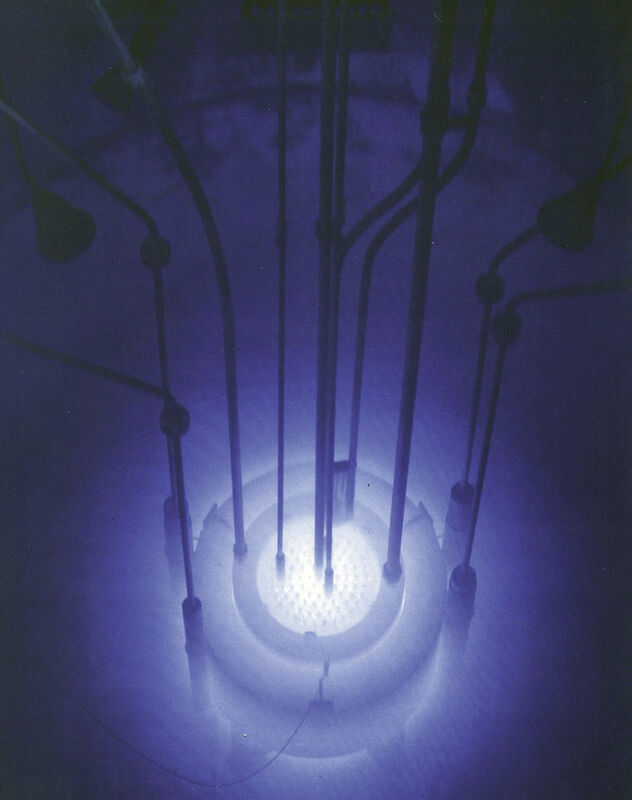 In pool-type nuclear reactors, the intensity of Cherenkov radiation is related to the frequency of the fission events that produce high-energy electrons, and hence is a measure of the intensity of the reaction. Similarly, Cherenkov radiation is used to characterize the remaining radioactivityof spent fuel rods. 3rd. Astrophysical experiments. The Cherenkov radiation from these charged particles is used to determine the source and intensity of the cosmic ray,s which is used for example in the different classes of cosmic ray detection experiments. For instance, Ice-Cube, Pierre-Auger, VERITAS, HESS, MAGIC, SNO, and many others. Cherenkov radiation can also be used to determine properties of high-energy astronomical objects that emit gamma rays, such as supernova remnants and blazars. In this last class of experiments we place STACEE, in new Mexico. 4th. High-energy experiments. We have quoted already this, and there many examples in the actual LHC, for instance, in the ALICE experiment. Vacuum Cherenkov radiation (VCR) is the alledged and conjectured phenomenon which refers to the Cherenkov radiation/effect of a charged particle propagating in the physical vacuum. You can ask: why should it be possible? It is quite straightforward to understand the answer. The classical (non-quantum) theory of relativity (both special and general) clearly forbids any superluminal phenomena/propagating degrees of freedom for material particles, including this one (the vacuum case) because a particle with non-zero rest mass can reach speed of light only at infinite energy (besides, the nontrivial vacuum itself would create a preferred frame of reference, in violation of one of the relativistic postulates). However, according to modern views coming from the quantum theory, specially our knowledge of Quantum Field Theory, physical vacuum IS a nontrivial medium which affects the particles propagating through, and the magnitude of the effect increases with the energies of the particles! Then, a natural consequence follows: an actual speed of a photon becomes energy-dependent and thus can be less than the fundamental constant of speed of light, such that sufficiently fast particles can overcome it and start emitting Cherenkov radiation. In summary, any charged particle surpassing the speed of light in the physical vacuum should emit (Vacuum) Cherenkov radiation. Note that it is an inevitable consequence of the non-trivial nature of the physical vacuum in Quantum Field Theory. Indeed, some crazy people saying that superluminal particles arise in jets from supernovae, or in colliders like the LHC fail to explain why those particles don’t emit Cherenkov radiation. It is not true that real particles become superluminal in space or collider rings. It is also wrong in the case of neutrino propagation because in spite of being chargeless, neutrinos should experiment an analogue effect to the Cherenkov radiation called the Askaryan effect. Other (alternative) possibility or scenario arises in some Lorentz-violating theories ( or even CPT violating theories that can be equivalent or not to such Lorentz violations) when a speed of a propagating particle becomes higher than c which turns this particle into the tachyon. The tachyon with an electric charge would lose energy as Cherenkov radiation just as ordinary charged particles do when they exceed the local speed of light in a medium. A charged tachyon traveling in a vacuum therefore undergoes a constant proper-time acceleration and, by necessity, its worldline would form an hyperbola in space-time. These last type of vacuum Cherenkov effect can arise in theories like the Standard Model Extension, where Lorentz-violating terms do appear. 1st. Particles that propagate over cosmological distances can show differences in their propagation speed. 1. Measurements of time of flight. 2. Thresholds creation for: A) Vacuum Cherenkov effect, B) Photon decay in vacuum. 3. Shift in the so-called GZK cut-off. 4. Modified dispersion relationships induced by non-commutative theories of spacetime. Specially, there are time shifts/delays of photon signals induced by non-commutative spacetime theories. We will analyse this four cases separately, in a very short and clear fashion. I wish! There is still room for improvements with current or planned experiments, although the distance for TeV-observations is limited by absorption of TeV photons in low energy metagalactic radiation fields. Depending on the energy density of the target photon field one gets an energy dependent mean free path length, leading to an energy and redshift dependent cut off energy (the cut off energy is defined as the energy where the optical depth is one). Cherenkov effect and the spontaneous photon-decay . A) As we have studied here, the vacuum Cherenkov effect is a spontaneous emission of a photon by a charged particle . These effect occurs if the particle moves faster than the slowest possible radiated photon in vacuum! and it is independent of . In the case of , i.e., decreases with energy, you need a photon with . This is only possible if . where we have used in this case. 3. Shift in the GZK cut-off. As the energy of a proton increases,the pion production reaction can happen with low energy photons of the Cosmic Microwave Background (CMB). i) How one can get definite proof of non-existence GZK cut off? ii) If GZK cutoff doesn’t exist, then find out the reason? The first question could by answered by observation of a large sample of events at these energies, which is necessary for a final conclusion, since the GZK cutoff is a statistical phenomena. The current AUGER experiment, still under construction, may clarify if the GZK cutoff exists or not. The existence of the GZK cutoff would also yield new limits on Lorentz or CPT violation. For the second question, one explanation can be derived from Lorentz violation. If we do the calculation for GZK cutoff in Lorentz violated world we would get the modified proton dispersion relation as described in our previous equations with MODRE. 1st. Vacuum Cherenkov and related effects modifying the dispersion relations of special relativity are natural in many scenarios beyond the Standard Relativity (BSR) and beyond the Standard Model (BSM). 2nd. Any theory allowing for superluminal propagation has to explain the null-results from the observation of the vacuum Cherenkov effect. Otherwise, they are doomed. 3rd. There are strong bounds coming from astrophysical processes and even neutrino oscillation experiments that severely imposes and kill many models. However, it is true that current MODRE bound are far from being the most general bounds. We expect to improve these bounds with the next generation of experiments. 4th. Theories that can not pass these tests (SR obviously does) have to be banned. 5th. 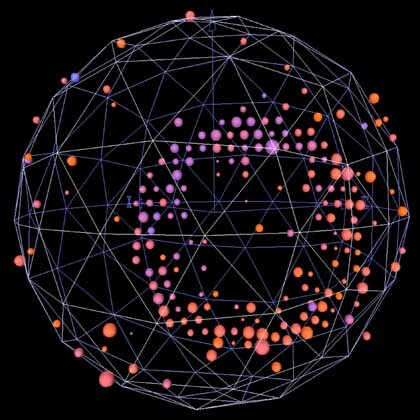 Superluminality has observable consequences, both in classical and quantum physics, both in standard theories and theories beyond standard theories. So, it you buid a theory allowing superluminal stuff, you must be very careful with what kind of predictions can and can not do. Otherwise, your theory is complentely nonsense. FINAL CHALLENGE: Are you able to identify the kind of particles producing those beautiful figures? Let me know your guesses ( I do know the answer, of course). Figure 1. Typical SuperKamiokande Ring. I dedicate this picture to my admired Japanase scientists there. I really, really admire that country and their people, specially after disasters like the 2011 Earthquake and the Fukushima accident. If you are a japanase reader/follower, you must know we support your from abroad. You were not, you are not and you shall not be alone. Figure 2. Typical MiniBooNe ring. History: I used this nice picture in my Master Thesis first page, as the cover/title page main picture! Before becoming apparent superluminal readers, we are going to remember and review some elementary notation and concepts from the relativistic Doppler effect and the starlight aberration we have already studied in this blog. In the range , the time interval separation measured from both pulses in the rest frame on Earth will be longer than in the rest frame of the moving object. This analysis remains valid even if the 2 events are not light beams/pulses but succesive packets or “maxima” of electromagnetic waves ( electromagnetic radiation). 3rd. Tangential or transversal motion of the source. This is also called second-order redshift. It has been observed in extremely precise velocity measurements of pulsars in our Galaxy. Furthermore, these redshifts have all been observed in different astrophysical observations and, in addition, they have to be taken into account for tracking the position via GPS, geolocating satellites and/or following their relative positions with respect to time or calculating their revolution periods around our planet. Remark: Quantum Mechanics and Special Relativity would be mutually inconsistent IF we did not find the same formual for the ratios between energy and frequencies at different reference frames. EXAMPLE: The emission line of the oxygen (II) [O(II)] is, in its rest frame, . It is observed in a distant galaxy to be at . What is the redshift z and the recession velocity of this galaxy? Note that this result follows from the hypothesis of the expansion of the Universe, and it holds in the relativistic theory of gravity, General Relativity, and it should also holds in extensions of it, even in Quantum Gravity somehow! Remember: Stellar aberration causes taht the positions on the sky of the celestial objects are changing as the Earth moves around the Sun. As the Earth’s velocity is about , and then , it implies an angular separation about . Anyway, it is worth mentioning that the astronomer Bradley observed this starlight aberration in 1729! A moving observer observes that light from stars are at different positions with respect to a rest observer, and that the new position does not depend on the distance to the star. Thus, as the relative velocity increases, stars are “displaced” further and further towards the direction of observation. Now, we are going to the main subject of the post. I decided to review this two important effects because it is useful to remember then and to understand that they are measured and they are real effects. They are not mere artifacts of the special theory of relativity masking some unknown reality. They are the reality in the sense they are measured. Alternative theories trying to understand these effects exist but they are more complicated and they remember me those people trying to defend the geocentric model of the Universe with those weird metaphenomenon known as epicycles in order to defend what can not be defended from the experimental viewpoint. Knowing the rate expansion of the universe and the redshift of the radiogalaxy, its distance is calculated to be about . To obtain the relative tangential velocity, we simply multiply the angular velocity by the distance, i.e. .
-A moving object with velocity with respect to Earth, approaching to Earth. -The moving object emits flashes of light at two different points, A and B, separated by some time interval in the Earth reference frame. -The distance between those two points A and B, is very small compared with the distance object-Earth, i.e., . Question: What is the time separation between the receptions of the pulses at the Earth surface? Remark (I): IFF AND ! Remark (II): There are some other sources of fake superluminality in special relativity or general relativity (the relativist theory of gravity). One example is that the phase velocity and the group velocity can indeed exceed the speed of light, since from the equation , it is obvious that whenever that one of those two velocities (group or phase velocity) are lower than the speed of light at vacuum, the another has to be exceeding the speed of light. That is not observable but it has an important rôle in the de Broglie wave-particle portrait of the atom. Other important example of apparent and fake superluminal motion is caused by gravitational (micro)lensing in General Relativity. Due to the effect of intense gravitational fields ( i.e., big concentrations of mass-energy), light beams from slow-movinh objects can be magnified to make them, apparently, superluminal. In this sense, gravity acts in an analogue way of a lens, i.e., as it there were a refraction index and modifying the propagation of the light emitted by the sources. Final challenge: With the date given above, what would the minimal value of be in order to account for the observed motion and apparent (fake) superluminal velocity of the radiogalaxy 3C 273?